Sevenoaks is a commuter town located in western Kent. It is famous for Knole Park, a 1,000 acre park full of wild deer. Sevenoaks can be reached by car via the A21 and A25. 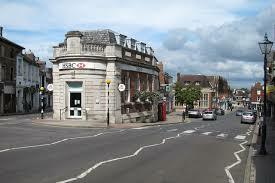 Sevenoaks is well served by public transport and has two railway stations: Sevenoaks and Bat & Ball. Lanes School of Driving first started giving lessons in 1914. Ever since, Lanes has been instructing locals how to drive. From small beginnings, Lanes has developed to become one of the largest driving schools in the UK. Lanes is renowned for holding the highest standards of excellence in driving instruction, grounded in its wealth of experience. Lanes takes care to cater to each student individually and students are given instruction tailored to their particular needs. Lanes is aware that students lead busy lives and bookings can be arranged to fit around their schedules. Lanes’ ethos is to enable each student to learn at a speed which suits them. Lanes stands out amongst driving schools in providing one-on-one tuition in order that students can receive instruction without the presence of other students. Lanes has an array of contemporary vehicles fully furnished with the latest technology, thus providing students with a fantastic experience when they learn to drive. As part of Lanes’ commitment to customer service, students can be picked up from their homes. Lanes have been providing driving lessons in Sevenoaks, Kent for many years. Please call us today on 020 8166 5678 or click here to send us an email via the contact page. Lanes has on call a team of instructors who are experienced and qualified to the highest standards. Every instructor is registered as a DSA Approved Driving instructor. The vast majority of our instructors started their initial training with ourselves. We understand the importance of the instructor-student relationship and to this end we ensure each student has the same instructor for all of his or her lessons. In our experience this enables each instructor to be aware of each student’s particular challenges and is able to plan each lesson accordingly. Lanes have a team of driving instructors in Sevenoaks, Kent. Please call us today on 020 8166 5678 or click here to send us an email via the contact page. It is not uncommon for students to find learning to drive a scary experience. Some women students are very nervous and would prefer not to have a male driving instructor. We understand this and we give female students the choice to have a female driving instructor. Our female driving instructors are very calm and unhurried in their approach. They will not criticise students or pressure them in any way. Our female students find that our female instructors allow them to progress in a relaxed environment. Lanes have a selection of female driving instructors in Sevenoaks, Kent. Please call us today on 020 8166 5678 or click hereto send us an email via the contact page. A good number of Lanes’ students prefer to learn in an automatic car rather than a manual car. Proponents of manual cars say that they afford greater control. However it is undeniable that automatic cars are less challenging for the learner driver. Stalling the car is always a problem for learners. Fortunately it is impossible to stall an automatic car. Automatic cars can provide a much less stressful experience for the learner driver, and progress will often be faster. Lanes have a selection of automatic driving instructors in Sevenoaks, Kent. Please call us today on 020 8166 5678 or click here to send us an email via the contact page.